Weddings on Wirt Street, the small chapel located at 3 Wirt Street NW in Leesburg, is pleased to announce a special offer for ceremonies performed on November 11th. “Our goal is to perform eleven weddings that day,” said Suzanne Fox who manages the venue. November 11, 2011 (11/11/11) is the next to last date with matching months, days and years until 12/12/12 and then it will be nearly a century until that sequence reoccurs (01/01/2101). Don’t want to wait a month and a year or a century to have a memorable wedding date? 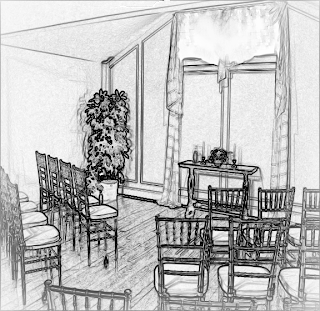 The lovely chapel will be available as early as 6AM and as late as 11PM at one-hour intervals for a special price of $111.11 (tax included but not including the charge for the officiant). You will, of course, need a valid Virginia marriage license and an official to perform the ceremony. You may bring your own clergy or the Loudoun County Clerk of Courts can provide a list of licensed Civil Celebrants. The special is limited to 10 or fewer guests including the wedding couple. Longer and larger events can also be accommodated at a nominal additional charge. Several restaurants in the historic district will provide gift certificates for post-ceremony meals or refreshments. If you are interested in having an anniversary date you will never forget, please contact Suzanne Fox, 703.777.2927 or info@weddingsonwirt.com for more information.